Jennifer Visick teaches viola, violin, and Suzuki Early Childhood Education classes. She is a graduate of the Claire Trevor School of the Arts at the University of California, Irvine where she earned a Bachelor of Music degree in Viola Performance. She teaches viola and violin privately in her own studio; teaches viola, violin, & early childhood “Music & Movement” classes for the Pasadena Suzuki Music Program; directs the Handbell Choir and the after school “Suzuki String Academy” at St. Margaret’s Episcopal School in San Juan Capistrano; and directs and coaches at CYOSC, a youth orchestra based in Orange County. 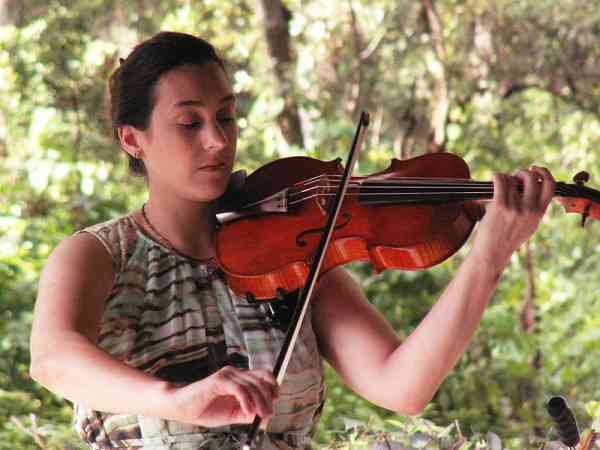 She also performs regularly in worship services for her church, and was a founding member of the Elegie String Quartet. Her viola instructors have included John Scanlon, Jerzy Kosmala, Yvonne Creanga, Laura Kuennen-Poper, and Margaret Shimizu. She has taken Creative Ability Development teacher training with Alice Kanack, and has taken Suzuki teacher training with Kerstin Wartberg, Julia Hardie, William Preucil, Rick Mooney, Susan Kempter, Christie Felsing, Barbara Barber, Laurie Scott, Ronda Cole, Elizabeth Stuen-Walker, Edward Kreitman, Edmund Sprunger, and Lorraine Fink. A proponent of life-long learning, Jennifer pursues ongoing studies in music education specializing in injury-prevention for musicians, and has been influenced in this area by the Andover Educator’s course “What Every Musician Needs to Know about the Body” as well as Robyn Avalon’s “Living in a Body” courses which deal with BodyMapping and the Alexander Technique; by William Fitzpatrick’s “In Search Of” course and Karen Tuttle’s “Coordination” Workshop; and by Janet Horvath (author of Playing (Less) Hurt), as well as by Susan Kempter’s “Playing the Violin with the Body in Mind” book and class. Jennifer is a member of the Christian Performing Artist’s Fellowship, the American Viola Society, the Suzuki Association of the Americas, and the Suzuki Music Association of California-Los Angeles Branch. Her personal website can be found at www.jennyvisick.com.